Henri Salvador has become a notable figure of 20th-century French music; he was a jazz musician, a comedian and a television presenter. But above all else, he was a performer, singing many of the greatest French songs. Henri Salvador was born on 18 July 1917 in Cayenne, French Guiana. He grew up surrounded by song and rhythm, his father an amateur violinist and his mother an amateur singer with a beautiful voice. In his 1994 biography he wrote, “I inherited her vocal tone and I think I spent my whole life imitating her, or at least trying to get close to her perfection”. When he moved to Paris at 12, the young Henri was met by a grey and at times hostile city, which he would ultimately make into his playground. 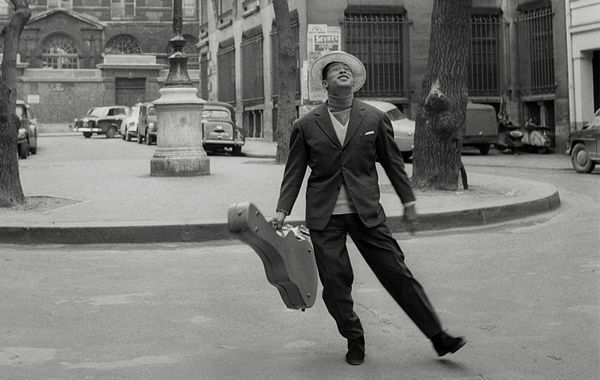 He remained attached to the city throughout his life, as well as to jazz and French music. So, without further ado, here are 10 (small) things you may not know about the comic singer Henri Salvador. The Salvador family moved to Paris in 1929 so that the children would have access to the best schools. They hoped that the youngest, Henri, would become a pharmacist. But he was a truant, spending his time instead learning slang in the streets of the capital with his friend Arsène. At the age of fifteen, he discovered the jazz of greats such as Louis Armstrong and Duke Ellington and decided to become a musician. He became immediately enamoured with the music of Django Reinhardt upon hearing it on the radio, making him choose to play the guitar. Henri and his older brother André practiced every day to reach their goal of joining a band. The Salvador brothers ended up playing in Boulogne-sur-Mer, Paris and Nice, where they met Ray Ventura, who later asked Henri to join him on a large tour of Brazil. Henri Salvador the singer was born in 1947, on his return from Brazil, when he started a one-man show at the Théâtre Bobino. He was an instant success: his show was critically acclaimed and marked the beginning of his long and rich career. The name Henri Salvador is associated with the songs and standards of the French repertoire, like the famous lullaby La biche et le chevalier, better known as Une chanson douce. But he is also well known for his unique and incredibly contagious laugh. As a teenager, his distinctive laugh already attracted attention when he laughed in the front row of the cirque Médrano during the act of Rhum the clown. After the show he was brought backstage by the clown and thanked for his thunderous laughter. The clown invited him to come back every Sunday, to laugh, for free. Nearly 30 years later, at the height of his fame, Henri Salvador made his laugh into a sketch, a number in its own right. “Imagine, the other day I laughed, and after laughing, I found that people having heard me laugh laughed, to have heard me laugh,” he would explain to his audience. “So, I thought, it’s very simple! It is completely ridiculous that I spend time writing sketches to make people laugh: I just have to laugh”. Henri Salvador laughed a lot but he was always trying to make others laugh. He and his brother André played guitar as part of a comic duet early in their careers, performing sketches and exchanging funny faces between each of their pieces. A few years later, while traveling through Brazil with Ray Ventura’s orchestra, he managed to get the group through a particuarly bad show by imitating the cartoon character Popeye. Henri discovered his potential and took a liking to the one-man-show. His desire to clown around can be clearly found in his songs. In the 1960s Henri Salvador had several humorous smash hits (Zorro est arrivé, Le travail c’est la santé, Juanita Banana…). The videos were each crazier than the last. His taste for directing and love of comedy worked perfectly with the emerging TV culture. Televisions began to enter French living rooms and Salvador’s comic personality appealed to the whole family. Henri Salvador was obsessed with comedy but also had very high standards and clear ideas of how music and jazz in particular, his first love, should be. In 1956, the young Michel Legrand (whom Henri had hired as a conductor, feeling he had a great future ahead of him), returned from New York with a new musical genre in his luggage– rock and roll. Henri and his friend Boris Vian felt that rock and roll was nothing but a bad parody of jazz, and that if it were to conquer France it would only be in the form of a pastiche or joke. So the three friends recorded a parody album, under the pseudonyms Henry Cording, Vernon Sinclair (Boris Vian) and Mig Bike (Michael Legrand), “Henry Cording and his Original Rock and Roll Boys”. The hoax was a huge success: Salvador, Vian and Legrand, who did not believe in the future of French rock, became forefathers of the genre! Their songs Va t’faire cuire un œuf, man and Rock hoquet were taken, at least musically, seriously. In 1949 Henri Salvador performed at the ABC, the famous Parisian music hall. A young brunette woman was sat in the front rows for several nights. Henri was enamoured and described her to one of the porters, François, and asked him to seek out the young woman and to invite her backstage. A few days later, François saw the beautiful brunette and gave her the message. When Jacqueline Garabédian entered the singer’s dressing room for the first time she was very nervous and said “I admire you very much”, to which he replied “I understand, I’ve been waiting for you for 32 years”. Two years later the porter François was a witness at their wedding. Henri and Jacqueline lived together for 27 years, during this time the shy young woman slowly transformed into a real businesswoman. She became her husband’s impresario, co-created the Salvador record label and participated in the production of some its greatest hits. Jacqueline followed Henri everywhere. Her death in 1976 left a terrible void in the singer’s life. Henri Salvador was a passionate man; he was a lover of music, jazz, women and…. pétanque. When he was not on stage he liked to play boules, in Paris, Cannes and Avignon. As he explained in October 1985 to the magazine Paroles et Musique, “I prefer playing pétanque than working. But what people do not know is that while I play pétanque, I compose”. When he was in Paris he could be found every Sunday on the Esplanade des Invalides, with other passionate pétanque players. Here he had the idea for coloured balls, that would be more easily identifiable by players. For Salvador, Pétanque was both a sport and an art! He was even crowned champion several times. The name Henri Salvador is so well-known in France that many often forget the great artists behind many of his greatest songs. First there was the duo of composer Bernard Michel and lyricist Maurice Pon, who authored his first great songs. Then there was Boris Vian, a major part of music scene, always to be found in the Parisian clubs and the cafés of Saint-Germain-des-Près with the jazz artists of the Hot Club de France. He and Salvador were great collaborators and inseperable friends from the late 50s until Vian’s death. Each of Salvador’s successes were born in part due to this sort of alchemy – with his wife Jacqueline, his friends, or with young artists such as Keren Ann and Benjamin Biolay who composed Jardin d’Hiver for him in 2000 for the album Chambre avec vue, one of Salvador's favourite albums signalling his comeback. It is not surprising that in his almost fifty year long career Henri Salvador befriended many of the greatest names of the 20th century – composer and writer Boris Vian, producer Eddie Barclay, singer and guitarist Georges Brassens, American trumpet player Quincy Jones, and many others. However, the singer was not entirely typical; in Cannes he preferred playing pétanque to walking the red carpet. In Paris, though he enjoyed hosting his television show he preferred dining intimately with friends to more formal social evenings. Though he was a great star he developed a dislike for the world of show business. When his career went through a rough patch in the 1980s he uncharacteristically and harshly denounced the world industry. Henri Salvador first visited Brazil in the 1940s with Ray Ventura’s orchestra. 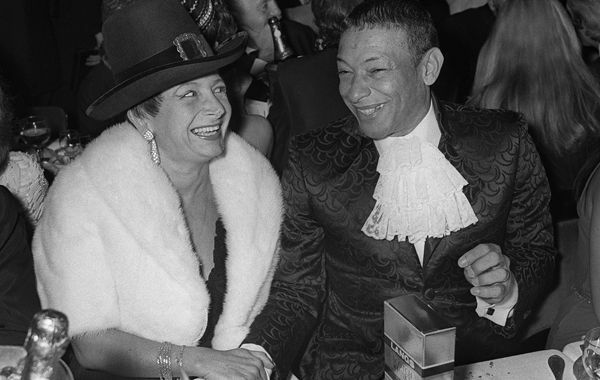 Twenty years later, Dans mon île was such a huge success in Brazil that it is said to have inspired the first bossa nova compositions, a delicious mix of jazz and samba. When he returned to Brazil in 2006, Henri was welcomed as a king. He was asked to add his handprints to the famous Toca do Vinicius pavement. 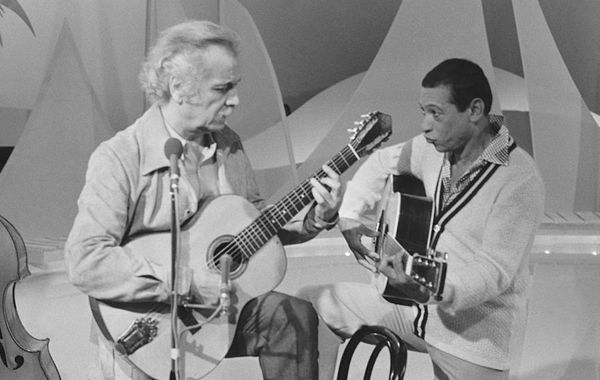 He also sang a duet with Gilberto Gil, the then Minister of Culture, who decorated Salvador with the Order of Merit and two years later deeply mourned the passing of “one of the leading singers of bossa nova”. “People who laugh do not age”, Henri Salvador declared to Paris Match in October 1985. And indeed, it is as if the laughing singer never aged. He unexpectedly revived his career, starred on the cover of Inrockuptibles and played at the biggest contemporary music fesitvals (Francofolies, Vieilles Charrues) when he was over 80 years old. He was full of silence as well as laughter. When an issue was too painful he avoided it through silence. In this way tense or difficult relationships became permanently bogged down, like that with his elder brother André or his “secret son”, the photographer Jean-Marie Périer. Protracted silences allowed him to forget or at least to pretend he had forgotten. Almost ten years after his death, however, Henri Salvador is far from forgotten. His songs are still performed, his comedy numbers continue to make people laugh and his name has even entered the prestige Robert Laffont Dictionnaire du Jazz (Jazz Dictionary).